JConsole gives basic information about activities happening on server. 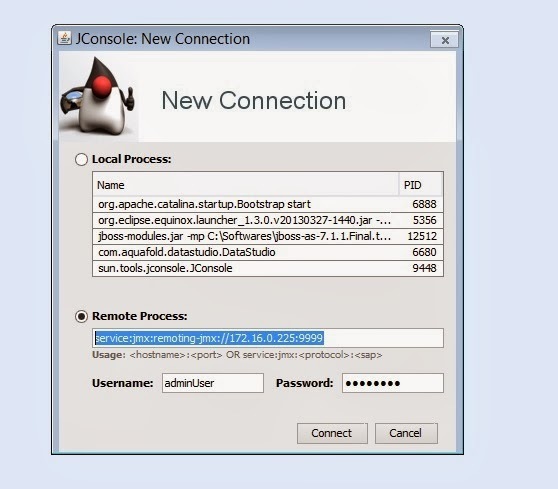 Below are the steps to start and point jconsole to a remote machine. To remotely connect to a JBoss machine you will need a local copy of JBoss too. In the bin folder of local JBoss look for jconsole.bat. Open this file a GUI will appear asking to connect to a local JVM or a remote one. Click on the Remote radio box and enter the below given URL. Provider username and password of the admin user of jboss. This will connect you to remote JBoss installed on remote machine. By using this tool we can analyze Heap size, CPU usage, Thread Dump and Number of Classes created.